One of the original members of the Allman Brothers Band has recruited a couple of local musicians for a newly announced show in Florida. Venice’s Berry Duane Oakley and former Bradenton Beach resident, Damon Fowler, will be part of Butch Trucks and the Freight Train Band’s next gig on September 19 at the Funky Biscuit in Boca Raton. The lineup for that performance is Trucks (drums), Oakley (bass/vocals), Fowler (guitar/vocals) and Al Poliak (keyboards). 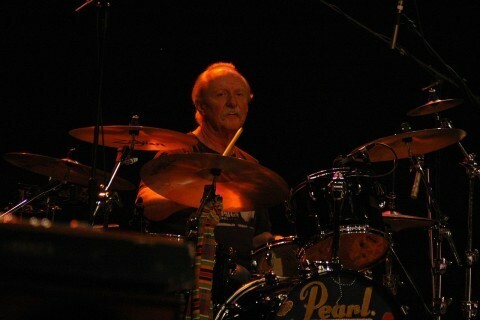 Oakley, who performs throughout the region with his band Skylab, has known Trucks pretty much his entire life, joining him and the rest of the Allman Brothers Band members at the podium when they were inducted into the Rock and Roll Hall of Fame in 1995. Oakley’s dad, also named Berry Oakley, was the bassist/vocalist in the original Allman Brothers Band and played with Trucks on such classic albums as “At Fillmore East,” “Eat a Peach” and “Brothers and Sisters” before being killed in a motorcycle accident in 1972. Prior to the Allman Brothers retiring last year, Oakley Jr. sat in with the band during several Beacon Theatre gigs in New York. For the past five years, since Freeman saw their debut performance at the Pinetop Perkins 97th Birthday Celebration at Antone’s in Austin, Texas, The Peterson Brothers have performed for enthusiastic fans at clubs and blues festivals across the country, including the prestigious Chicago Blues Festival and The King Biscuit Festival in Helena, Ark. They have also opened shows for B.B. King, Los Lonely Boys, Michael Burks, Pinetop Perkins & Willie “Big Eyes” Smith, Marcia Ball, and The Fabulous Thunderbirds. Buddy Guy invited them to share the stage with him during one of his shows at ACL Live at the Moody Theater in Austin and Willie Nelson had them open his show, the brothers being the only nonrelated act on the bill. Glenn, 18 years old, plays guitar and sings lead, delivering the blues with a heavy influence of funk in his rhythm guitar playing. Through a smooth, jazz-influenced style he combines a traditional blues approach to his leads reaching inspiration from blues greats BB King, Albert King and Freddie King, Buddy Guy, Albert Collins, Hubert Sumlin, T-Bone Walker and Lightnin’ Hopkins and borrowing from contemporary players like Robert Cray, Michael Burks, Ernie Isley, Eddie Hazel and jazz icons Wes Montgomery and Kenny Burrell. Alex, 16 years old, plays 5-string bass, violin and sings. He holds down their sound with supportive bass lines then breaks out with distinctive melodic riffs, often with a funk and jazz style that transcends his young age. Like his brother, he has a wealth of knowledge about his instrument and the musicians who have influenced him. They include Victor Wooten, Marcus Miller, Jacob Pastorius, Larry Graham, Bootsy Collins, Ron Carter, Ray Brown, Quintin Berry, Louis Johnson, Adam Blackstone, Stanley Clarke, Rocco Prestia Bob Stroger, and James Jamerson. Blue Point Records is Michael Freeman’s independent record label. Freeman’s credits are extensive and include Pinetop Perkins and Willie “Big Eyes” Smith’s Grammy and Blues Music Award winning album Joined At The Hip. 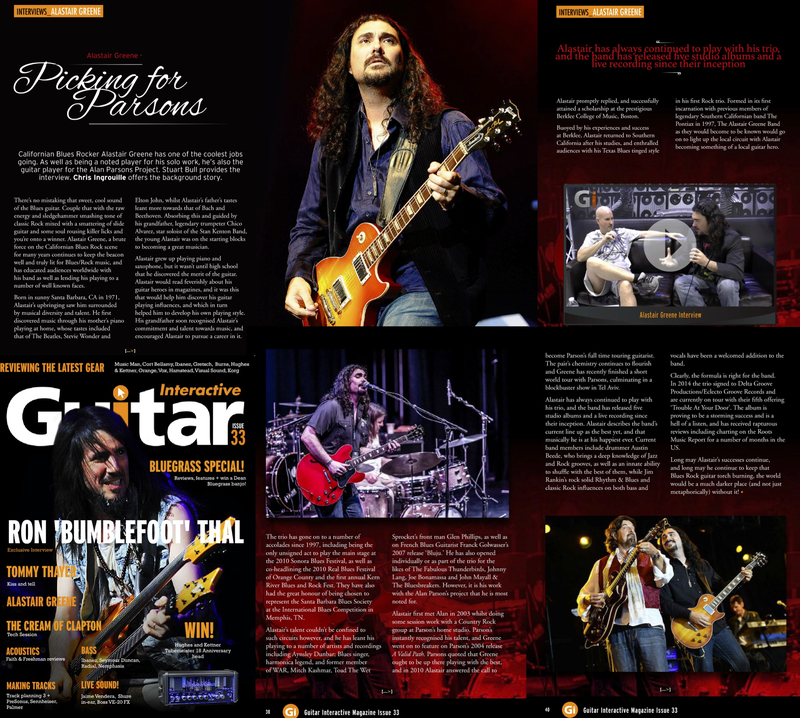 Guitar Interactive Magazine highlights all that is happening in the Rock world today. This month, Issue No. 33, features Alastair Greene. Ron Thor is the cover story and bluegrass music is the month’s focus. 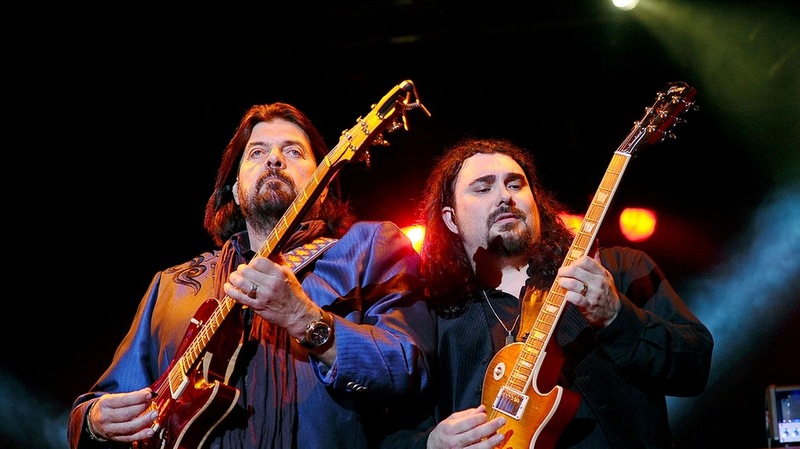 Click the link below and read about Alastair’s life with Alan Parsons and watch the exclusive interview that accompanies the article. All on-line; all at your finger tips; all free! 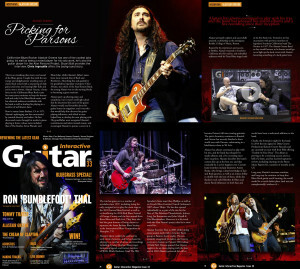 GUITAR INTERACTIVE MAGAZINE, ISSUE 33. The New Orleans Jazz & Heritage Festival will soon begin. And when it does, it’s important not to forget the annual Sync Up Conference. A free industry conference presented by the New Orleans Jazz & Heritage Foundation. Sync Up brings together leaders in music, film and digital media for education and networking events – all designed to help independent artists navigate the ever-changing landscape of new media. This year the conference has been moved to the George and Joyce Wein Jazz & Heritage Center. A state-of-the-art education and performance facility located at the gateway of the Treme neighborhood. 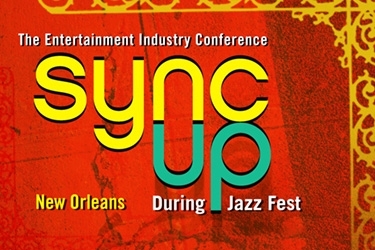 Sync Up Music will host sessions on the mornings of the Friday and Saturday of both weekends of the New Orleans Jazz & Heritage Festival. Sync Up Cinema (organized by the New Orleans Video Access Center and the New Orleans Film Society) will present film screenings and workshops on the Monday-Wednesday between Jazz Fest weekends. And once again, Launch Fest – which connects technology start-ups with venture capital – will take place on the Thursday between weekends. It’s long been said that getting a booking agent can be harder than getting a record deal – especially these days, now that even indie releases are getting Grammy nominations. So, what does a musician – whether a newcomer or a veteran – need to have before a booking agent will take them on? And once an artist signs with an agency, that means they’ll never have to hustle for gigs ever again and their performance fees will always be in the mid-five figures – right? Maybe, maybe not. We’ve assembled a group of agents with long experience working with up-and-coming as well as established acts, including many from Louisiana. Being a free event, seating is limited. Advance registration is required. Link to register for Sync Up Music: http://www.jazzandheritage.org/sync-up/registration. Music Publishing: A keynote interview with Matt Pincus, CEO and founder of Songs Music Publishing, which with artists like Lorde, DJ Mustard and Q-Tip is one of the hottest boutique publishers in the business. Touring: Two panels featuring booking agents with long experience helping up-and-coming as well as established acts build profitable careers on the road. Independent Distribution: A keynote interview with David Macias, co-founder and CEO of Thirty Tigers, who is helping independent artists top the charts and score Grammy nominations while owning their own masters. Crowdfunding: A panel with local artists who can share lessons from working with various platforms, including Indiegogo, Pledge Music and Kickstarter. Case Studies: Sturgill Simpson and Aaron Watson, two artists who have hit the big time on self-released records, will be the subjects of special presentations. Digital Distribution: Top leaders from Bit Torrent will discuss why their platform – once known only for file sharing (stealing) – is now the first choice for rappers like Curren$y and rock stars like Thom Yorke of Radiohead. E-Commerce: The drummer Stanton Moore shares his creative ideas for making money over the Internet. Music In Film: Music coordinators for three TV shows that are filming right now on the streets of New Orleans will explain how best to get local music into their shows. We would like to announce that Jason Ricci will perform to honor this year’s 2015 Rock n Roll Hall of Fame inductees which takes place in Cleveland, OH on April 18th. Jason will be a part of the performance tribute to the Paul Butterfield Blues Band. He will join Zac Brown, Tom Morello and others in this tribute performance. Performers include Beck, Dave Grohl, Joe Walsh, Tom Morello, John Legend, Jimmie Vaughan and others to be announced. Tickets to the ceremony are sold-out, but a limited number of VIP packages are still available by calling (216) 515-1232 or emailing development@rockhall.org. The broadcast will premiere on HBO on Saturday, May 30, 2015. The Rock and Roll Hall of Fame and Museum in Cleveland will also celebrate the 2015 Inductees with a new expanded 2015 Inductee exhibit scheduled to open in April honoring this year’s Inductees: the Paul Butterfield Blues Band, Joan Jett & the Blackhearts, Green Day, Lou Reed, Stevie Ray Vaughan & Double Trouble, Bill Withers, Ringo Starr and the “5” Royales. For more information on the 30th Annual Rock and Roll Hall of Fame Induction Ceremony activities visit www.rockhall.com. Alastair Greene was born and raised in Santa Barbara, California and has been the resident guitar hero of this sunny seaside town for many years. That is, up until five years ago when he was asked to join the Alan Parsons Live Project, who he has been touring the world with since. 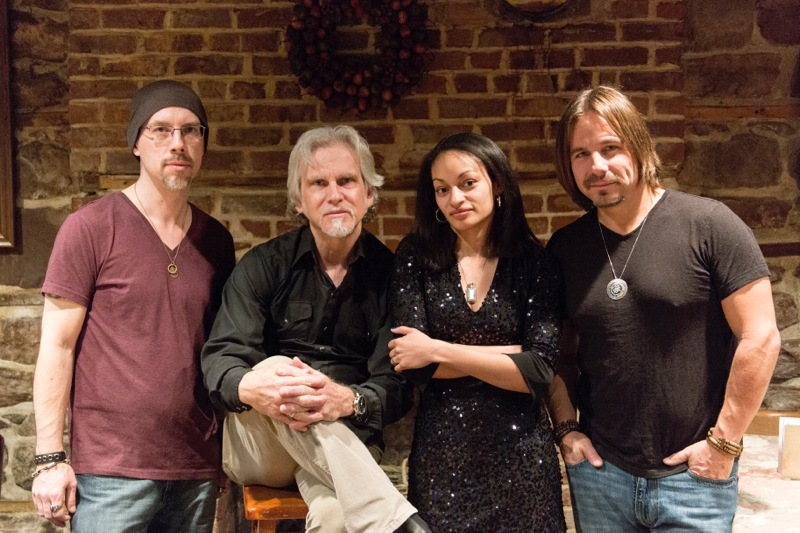 Greene’s band, a blues rock trio aptly named Alastair Greene Band, was recently signed to Eclectic Groove Records and released the critically acclaimed blues rock album TROUBLE AT YOUR DOOR in June of 2014. In addition to playing Alan Parsons Project hits in arenas around the world and touring with his own band, Greene recently filled in for some prime tour dates with Starship, featuring <stronghttp://>Mickey Thomas. Greene has just returned from a sold out show in Tel Aviv, Israel with Alan Parsons and is set to embark on tour again with the British prog and pop legend this March. Tour stops will include shows in Canada, England, Switzerland, Germany, and Italy (tour dates listed below). The Alastair Greene Band was formed in 1997 and has remained a blues rock trio much in the vein of early Gov’t Mule, Cream, and Rory Gallagher. Their new album, TROUBLE AT YOUR DOOR, recently garnered the attention of Johnny Winter‘s former booking agent, Tina Terry. The Alastair Greene Band was signed as one of the flagship acts to the Tina Terry Agency in January 2015 (tour dates TBA). How does a blues rocker feel about touring with a prog rock legend such as Alan Parsons, or a pop rock band such as Starship, or his own blues rock trio, the Alastair Greene Band? 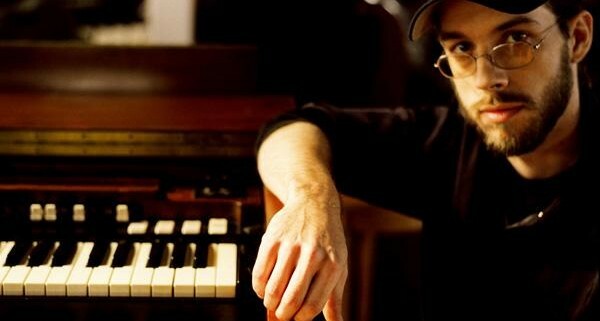 Blind Pig Records has announced the signing of award-winning guitarist, organist, singer, and songwriter Zac Harmon. His distinctive style combines the best of old-school soul-blues artists with modern lyrics and themes that bring the blues into a new century. The first release under the pact, Stand Your Ground, is contemporary music that proves just how alive and relevant the blues is today. Addressing issues straight from today’s headlines, Zac presents them in a fresh original style built on the best blues tradition. And he has some incredibly talented musicians helping him. Guests include Bobby Rush, Lucky Peterson, Anson Funderburgh and Mike Finnegan. Zac’s first CD in six years, Stand Your Ground, will be released in the early fall. A native of Jackson, Mississippi, Harmon played guitar for Z.Z. Hill, Dorothy Moore and Sam Myers before moving to L.A., where he established himself as a successful session musician, songwriter, and producer, working with the likes of Evelyn “Champagne” King, the Whispers, the O’Jays and Black Uhuru. 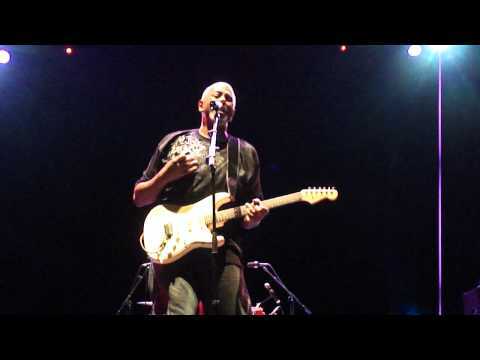 Zac was introduced as a true torchbearer for the “next generation of the blues” in 2004 when he won the Blues Foundation’s prestigious International Blues Challenge (IBC) title of “Best Unsigned Band.” Two years later, Harmon won the Blues Music Award for “Best New Artist Debut” for The Blues According to Zacariah. Since then he’s become one of the blues’ strongest live performers, thrilling fans everywhere from Memphis to Mumbai. With Stand Your Ground he finally brings that excitement to a brand new CD, his bluesiest ever. The cosmic American love child of Howlin Wolf and Link Wray! Known as a “musician’s musician,” Alvin Youngblood Hart’s praises have been sung by everyone from Bob Dylan to Brit guitar gods Eric Clapton & Mick Taylor. Since the release of his 1996 debut recording, the all-acoustic BIG MAMA’S DOOR, Hart has relayed his eclectic musical message around the world. A devout follower of the “no barriers” approach carved out by veteran performers like Gatemouth Brown and the late/great Doug Sahm, Hart aims to delight the masses and points to challenge the so-called blues purists. After spending much of the past year touring with the band Southern Hospitality, Damon Fowler is back with his third solo project for Blind Pig Records, Sounds of Home. Damon chose swamp blues master Tab Benoit to produce and record him at Tab’s rural Louisiana home studio, and their collaboration has resulted in Damon’s strongest effort to date. On the strength of his hybrid of roots rock, blues, and sacred steel, the Florida native started wowing audiences with his musical exploits as a teenager, building a reputation as one of the hottest young players on the scene. 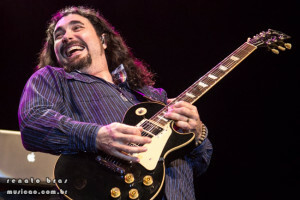 Adding songwriting and vocal skills to his repertoire over the years has brought him many accolades, with critics extolling his originality and maturity as well as his technical guitar expertise. The Todd Wolfe Band, one of the hardest working blues-rock ensembles in the business, are joined by acclaimed organist John Ginty, for shows in the Northeast for a limited time throughout 2015. Wolfe and Ginty had recently collaborated on the band’s highly-praised album, “Miles To Go” (American ShowplaceMusic). Ginty has toured and recorded with artists such as Jewel, Citizen Cope, Santana, Dixie Chicks, Matthew Sweet, and the Court Yard Hounds. The New Jersey native is an original member of Robert Randolph and the Family Band, for which he received two Grammy Nominations. Longtime guitar ace Todd Wolfe is known for his work with the great Sheryl Crow (five years as her lead guitarist in the ’90’s), Carla Olson (the Textones); and Leslie West (Mountain), among others, throughout a stellar career. Todd and band had just returned from yet another road trip – four in 2014 alone, totalling close to 40,000 miles, from the Czech Republic to San Francisco – and received year-end accolades including a “Best Band” win from RockWired Magazine. Wolfe has released eight albums since 1999 and has written songs for acts as diverse as country star Faith Hill and Stevie Nicks. Please reach out to the Tina Terry Agency for further information: 336-273-0446 / info@tinaterryagency.com.